The cats are amazingly tolerant of each other, and the Quimper Hittys love them even though the milk consumption has doubled! The kitties have staked out their territory – one step each! Your needles have been very, very busy and very, very quaint sweeties have come forth. Another smile has come forth with your lovely narratives from the QH household. It is such fun to knit these wee kitties, I just couldn’t help myself! Several have gone off to other homes, but these ones are making themselves very comfortable in the Hitty cupboard! Lovely cat “family” …I’d love to deliver milk! First day today cats could sun bathe here with no risk of catching pneumonia!!!! At long last…it looks like Spring!!!!! Even if you don’t deliver milk, I am sure you would be beloved by the Quimper Hitty cats! I am glad that spring is finally arriving in Quebec! Seems like a new cat does appear every day! Sometimes two cats! And yes, it is paradise, certainly for the cats! Wonderful cat family! And I love your doll’s house too. Can you tell me again who made it for you? We are very happy to be able to entertain so may cats. Of course they mostly sleep all day so they don’t need much entertaining! 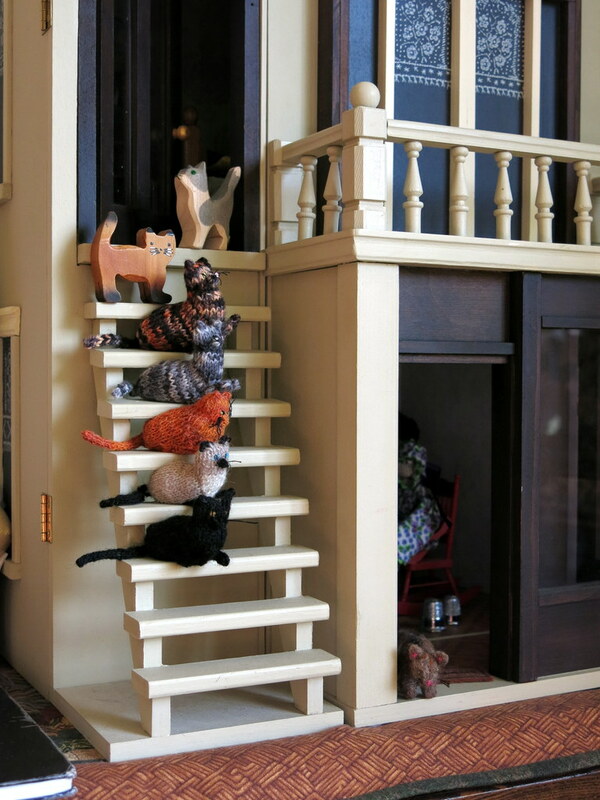 My wonderful dollhouse was made by Art to Play With, in Quebec. Click here for a link to the website. Oh gosh these are super! I am so miffed at not being able to knit at the moment – seems to be ongoing! I keep seeing all these wonderful things I want to make and can’t. We have not exhausted our mania for knitting cats yet! I am sorry you are not able to join the Hitty knitting fun at the moment, hopefully you will be up for it soon! One of the cutest photos ever! Made me laugh….tooooo sweet! Thank you – the cats think it is no laughing matter to have no milk in the fridge, but we are glad you were tickled! Thanks for the great laugh today! Sweet photo, too. You are very welcome, we have had such fun knitting and playing and giving cats to deserving homes…I am glad you were amused! I adore this photo. It should be on the cover of a magazine.Simply FAB!!! Thank you…the scene just caught my eye. The cats obligingly sat there while I ran for my camera! Yes! They ready to twine around the milkman’s legs, as soon as he appeared – luckily he delivers to the door at the bottom of the steps! Thanks very much! We have such fun with our Hitty families, don’t we? We are so glad that you enjoy our Hitty-fun with us. All the dolls, are very fond of keddies, have more and more of them in our Hitty house, and now they have to buy more milk!